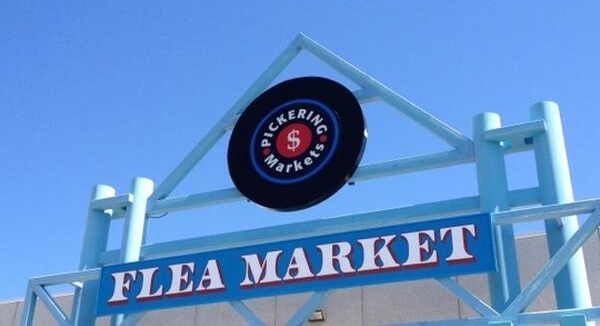 I recently moved to Durham region (Eastern Ontario) and had already heard plenty about the Pickering Flea market (1400 Squires Beach Road, Pickering Ontario). Personally, I’m the type that hates crowded areas and messy venues so I wasn’t interested at all until at some point literally every person who I had encountered would encourage me to visit. What was the big deal anyway? I thought to myself. I had been to one too many flea markets in my lifetime and had always ended up semi-satisfied with my finds. The time I wasted trying to find something was never really worth the discounts or good deals I’d eventually leave with. The market is only open on the weekends from 9am -5pm so we decided to go on a Saturday morning and see what the entire buzz was about. On my way there I had envisioned a not so refreshing atmosphere with hundreds of people crammed into small isles and no real flow of product just random things randomly put everywhere. The thought made me cringe. I love bargains but I hate wasting my time in clutter, but much to my surprise this flea market was very tidy, organized and huge! The first thing I noticed was that the entrances were divided by category: Trade, Antique, and Market. Thank goodness for whoever came up with that idea. I picked up a flyer only to read the most beautiful words to ever be written “Pickering Flea Market – Hear no retail, Speak no retail, See no retail”. YES! YES! YES! I thought to myself. It was clear my skeptic mood was about to change. The first building I entered was filled with winter clothing, household products as well as hair and makeup supplies. I found that most of the products were marked down at least 2-3 dollars and trust me…even those 2-3 dollars can add up. For example, the two conditioners I purchased in total cost me $11.50. That’s $5.75 a bottle. The same bottle that would cost me around 7.99 at most retail stores meaning I now was saving $4.48. So far so good. I patted myself on my shoulder. Bargain Queen 1, Expensive World 0. Right upon entering the second room I was distracted by the many food vendors in the food court. I did a small little tour around each food joint and finally decided on some Caribbean food, which was amazing and very friendly to my pockets! After devouring the food we continued through the aisles looking at everything from custom t-shirts, to jewellery, to rugs, to furniture and finally my best deal of the day, a beautiful auburn bed set…decoration PILLOWS INCLUDED! YAY! I approached the vendor and asked how much this beautiful bed set was going to cost me; she smiled and said $120. EEEEEK!! My body literally repelled from these digits. Her smile quickly changed after watching my reaction, “but for you my dear…$90”, she said with much confidence in her sale. I stood my ground, maintained an uninterested face and pretended to slowly walk away. SEVENTY-FIVE she said loudly and I turned around and literally screamed out DEAL! Now I know you’re thinking $75 dollars for a bed set is still expensive BUT I had seen almost the exact same design and material at a department store for well over $400. The quality of this set was just as nice and the price was even nicer. I saved $325. (I got excited just from typing that!) AGAIN....Bargain Queen 2, Expensive World 0. Overall the experience was pleasant. Aside from being an inexpensive shopping experience, it was also very entertaining. I found it easy to find what I needed and for the most part it was very tidy, not to mention that I walked away from Pickering Flea Marketing with a full stomach and I saved $329.48. It’s safe to say I’m in love. As a person who also loves a bargain, I say great blog Bargain Queen! It is nice to know there are still some pretty good deals out there. I do like a bargain, but after seeing a CBC documentary on the underground markets in North America, (ones dealing in shoplifted goods), I would be very wary of the type of deals you've described on brand name goods. Great post Roxanne. I've witness some good bargains there as well. I also purchased the most delicious seafood snacks from a vendor at the Pickering Flea Market I wish I knew the name but I agree with you it's the best Flea Market is the one in Pickering. Keep the blogs coming! Great post Bargain Queen...hope to hear more.